Cherished Teddies Melinda #661821. I'm Only A Hop Skip And A Jump Away If You Need Me. 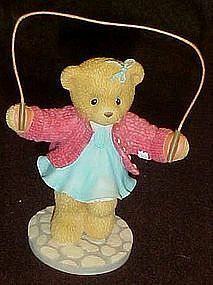 Teddy Girl Jumping Rope Figurine New in box with original packing & clean paperwork. Removed only to photograph. About 4" tall with jump rope.